Life with Liv: Planning for Livs Birthday. I can hardly believe it but The little baby Girl I had about 5 minutes ago is going to be 4 this week. Four! Where the time has gone I really don't know - I'm sure it actually speeds up when you become a Parent. Now that she is in nursery and interacting with a lot more Children, she is more aware of what others are having for their Birthday parties, so she is wanting more input this year. The theme - of course - is My Little Pony, they have been her absolute favourite toys and TV program for the last 18 months, in fact our house looks suspiciously like a Hasbro aisle in a toy shop - and I have a feeling it is about to become much worse! I allowed her to choose the theme but I have bought everything without her input so she will still have a surprise on the day. We have My Little Pony plates, cups, straws, napkins, table cloth, banners, balloons and party bags all ready for the big day. I just can't wait to set it all up and see her little face now! The Children's food is all planned and half bought, right down to the Piñata. With a lot of Adult Family members popping in too, I am planning a special little Adult area in the kitchen (well out of reach of little hands!) with Adult drinks, snacks and some amazing retro sweets. 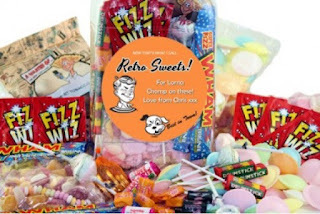 What more could you ask for at a kiddies party than a quiet area, your favourite tipple and some retro sweets taking you back to your own Childhood? I hope it goes down well! I remember going to the local corner shop with 50p for a brown bag of aniseed cough candy twists, they never fail to take me right back to primary school. What was your favourite Childhood sweet?